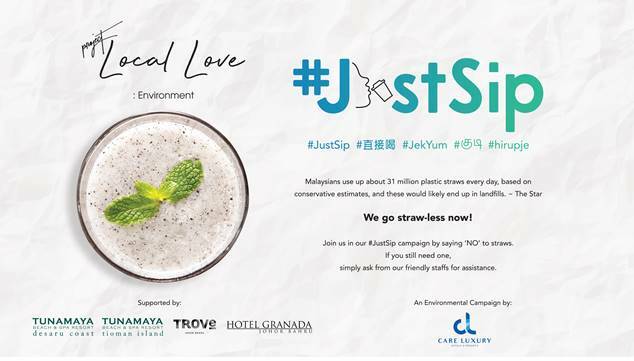 Care Luxury Hotels & Resorts is proud to announce that all of their hotels and resorts under the hospitality management are now serving drinks straw-less in conjunction with their corporate social responsibility initiative, #JustSip. #JustSip campaign is a part of Project Local Love (previously known as Care Luxury CARES) which is the management’s corporate social responsibility effort that every co-partner in the organization work with – each and every day – to ensure that they’re doing our part to build a sustainable tomorrow. Moreover, the management has always been motivated to opt for various options for the planet’s conservation initiative and to name a few, Care Luxury Hotels & Resorts practises in providing biodegradable in-room amenities, coral restoration in Tunamaya Tioman Island, and recycled plastic art installation exhibition in TROVE Hotel Johor Bahru.